In 1988, master horror/suspense filmmaker John Carpenter (The Thing, Escape from New York and most importantly, Halloween) made an action thriller about aliens surreptitiously taking over the Earth by planting subliminal messages everywhere and turning humans into mindless consumers. Thirty years later the impact of that film, They Live, is still being felt; Shepard Fairey adapted the graphic style of the pernicious sales message for his art. Under the pseudonym “Frank Armitage,” Carpenter adapted the Ray Nelson short story “Eight O’clock in the Morning” into a rousing, hilarious and ultimately unforgettable commentary on consumer culture starring wrestling star turned actor Roddy Piper and Keith David – a lesson that awes still on its thirtieth anniversary. 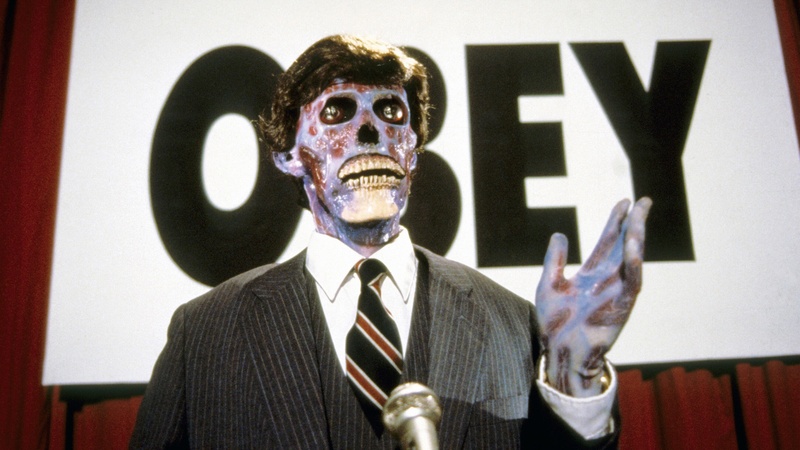 They Live plays the way it was intended to be seen – in a 35mm print. $5 for Film Independent and LACMA Film Club members. Members of these two groups can purchase tickets starting at 12:00 pm on Thursday, December 14. Limit two tickets per membership. Proof of member status is required to reserve tickets during advance reservation period. $7 for LACMA members, students with valid ID and seniors (65+); $10 for the general public. Members of these four groups can purchase tickets starting at 12:00 pm on Thursday, December 21. Two ticket limit. PLEASE NOTE: Pre-reserved tickets for this event can be picked up at LACMA’s Ticket Office, located in the Hammer Building, on the day of the event—as early as 11 am. Tickets are for general, unreserved Bing Theater seating. Ticketed guests must be in their Bing Theater seat 15 minutes prior to the advertised start time or seat(s) may be released. Reservations do not guarantee entry, even with a ticket in hand. Entry is first come, first served, so please arrive early. Program and guest participation subject to change or cancellation without prior notice. Tickets are nontransferable and can only be picked up by the individual who purchased or reserved them.